Outdated Link Notification: This is How It’s Done! Business.com acquired Top Ten Reviews which meant a link in one of my articles was going to die soon. I received this email from Business.com. This is how real professionals deal with a link that needs to be updated. The email clearly explains the situation. Then the email provides a link to the page with the outdated link. That is helpful in finding the page, especially if I published the page years ago. As it turns out the link was on a page I published in late 2016. 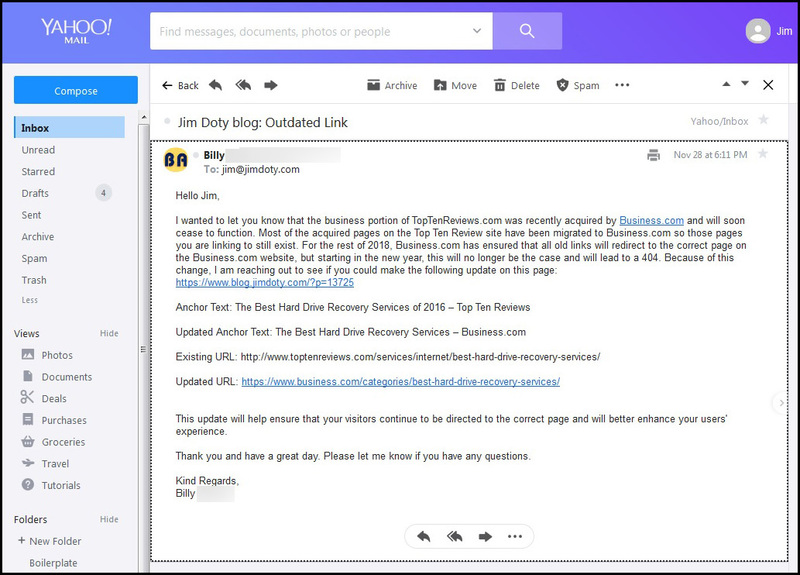 The email provides the old anchor text, the new anchor text, the old URL to Top Ten Reviews and the new URL to Business.com. That made things really easy for me. I copied the new anchor text right out of the email and dropped it into my article. Then I copied the new URL out of the email and turned the anchor text into a hyperlink. Billy made it all quick and simple. It is nice to deal with professionals! Kudos to Billy and Business.com. After I updated the 2016 article, I updated the 2017 and 2018 versions too. My updated article: My Hard Drive Crashed! Where Do I Send It To Get My Data Back?